Crawley Town let slip a lead before suffering a poor 2-1 defeat at the hands of Newport County. Two headed goals by Newport’s Mickey Demetriou either side of half-time sealed defeat for Harry Kewell’s men. Reds took the lead on the half hour through great work by Mark Connolly who headed in a free-kick supplied by Enzio Boldewijn. But soon after scoring they conceded a goal in the 39th minute through former Worthing player Demetriou. 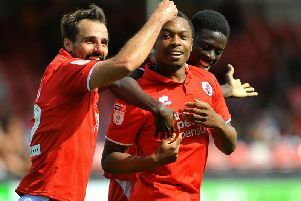 Demetriou, who also scored the winner in Reds’ defeat at Newport in April, then made it 2-1 to the visitors in identical fashion, again headed in from a corner-kick six minutes into the second half. Kewell fielded an unchanged side from the team which beat Barnet on Saturday. Reds had the better start with Jordan Roberts firing a free-kick straight to keeper Joe Day. Ibrahim Meite, who was playing up front with Roberts, went close with a volley which flew narrowly wide. Connolly got forward into a dangerous position to meet a ball from Jordan Roberts but it did not test the ‘keeper. However Connolly was back in the action again to nod home his first goal of the season when he met a fine free-kick by Roberts. Reds’ lead only lasted nine minutes as their defence switched off and allowed former Worthing and Eastbourne Borough player Demetriou to head in an equaliser from a corner-kick. Buoyed by their goal, County twice came close to scoring again as Robbie Willmott hit the crossbar from a tight angle. Reds had a big let-off moments before half-time when Sean Rigg waltzed through the defence and into the box but he couldn’t control his shot and luckily for Crawley it flew over the bar. Newport came out on the attack for the second half and Demetriou added their second goal which was also headed in from a corner-kick. Reds came so close to equalising when substitute Josh Payne, moments after coming on the field, struck a brilliant free-kick crashing against the post. However they did not produce enough by way of a fightback and there were some boos from the crowd when the final whistle blew.